You are here: Home / Ethnic Groups / The People of Sulawesi / Who are the Selayar? It is not difficult to reach the island of Selayar because a boat that makes the trip twice a day. There are flights that make the Makassar-Selayar trip as well. 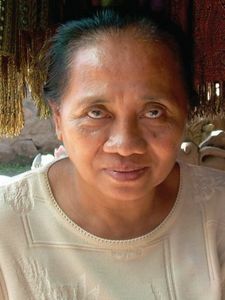 The Selayar language is part of a larger linguistic group called the Makassar which also includes the Konjo Pesisir (Konjo-coastal), Bentong and Makassar. To the Selayar people, farming is the primary economic mainstay in the region. Plantations’ produce includes guava, cloves, nutmeg, and cocoa. Kopra (dried coconut meat) and cloves were the two crops relied on in years past. However, because the price was like “falling rice,” this commodity is no longer attractive for local farmers. Several years ago, many farmers made the move to grow vanilla. The crops that were considered to be intercrops have begun to increase in value and have become the primary cash crops. Almost everything needed by the people in this area comes from Makassar and is delivered by public bus. Sometimes they place an order with the bus driver and he delivers it to him. The cost of having the bus driver pick up goods in Makassar is less than the cost to buy them in Selayar. The majority of Selayar are Muslim. Selayar cultural customs are strongly tied to their religion and are very influential in their daily lives, producing religious syncretism. Ten to twenty years ago or so, there was a group of Christian believers among the Selayar. As time went on, their numbers dropped because of pressure from the government and a mixing with Hindu beliefs. This has created a syncretistic form of Christianity. The Selayar area is made up of islands. Transportation and connections between this area and the outside world are extremely limited, resulting in isolation. Sea transportation is a felt need to help the community with economic development and inter-island mobility. The Selayar need help with economic matters. 85% of the Selayar area is ocean, yet the great riches of their ocean are neglected because only a small portion of the population are fishermen. Because of this void, others come to harvest the ocean’s riches.